The peace meeting sponsored by Russia and held in Moscow on 9th November was a positive development in possible peace process in Afghanistan. America is physically away from the centre of terrorism, though as a global power it considers itself neighbour of the whole world. But terrorism emanating from Afghanistan is basically a direct threat to the regional countries - Pakistan, Iran, China, Russia and its Central Asian backyard. Therefore, Russian and Chinese interest in Afghanistan is understandable, along with Pakistan, Iran and Central Asian states. Though these countries supported US and its NATO allies after 9/11 events, now they express some doubts about the US interests and plans in Afghanistan. Sergey Lavrov, the Russian Foreign Minister, expressed urgency for peace and pointed to the danger of ISIS (Daesh) to the whole region and world. Properly the existence of Daesh created mistrust in positions of Russia, China, Iran and Pakistan. Most of these countries consider the sudden and dubious emergence of Daesh in Afghanistan due to the tacit support of US, though the Americans have denied their involvement in this terrorist phenomenon. Even Taliban subscribe to this view. The participation of Indian delegation in Moscow meeting on ‘non-official level’ is interesting as Indians refused to participate in September 2018 meeting. They were emboldened by the fact that Taliban delegation was headed by one Haji Sher Muhammad Abbas Stanekzai, a former military officer trained in Military Academy of Dehradun. The US reluctantly sent its observer to the meeting and did not participate in the deliberations. Afghanistan was not represented on official level, but sent their low-level delegation of handpicked High Peace Council led by Din Muhammad. The Ghani government feels itself downgraded by the US, Russia and other regional powers which are dealing directly with Taliban. The Americans have even started to ignore Kabul in their direct contacts with Taliban. Taliban have come out openly also as a political force on the international level. Their demand to release five of topmost Taliban leaders from Guantanamo prison and becoming part of negotiating team in Qatar was accepted by the USA. However, their open stance did not change and remains rigid. They consider Kabul government as the US puppet and not representative of Afghan people, and do not want to negotiate with it. According to Taliban, only after the US withdrawal the group would be able to deal with the Kabul regime. The Moscow peace meeting was hailed by all as positive development towards permanent stability. Though nothing tangible can be expected from such meetings in a short term, the mere participation of Taliban in such modern mechanism to resolve problems is a good sign and a way forward. Only an inclusive Afghan-lead and Afghan-owned peace is in the interest of the region including Pakistan. Former Afghan President, Hamid Karzai, while on his recent visit of Kazakhstan, expressed his satisfaction about the outcome of the meeting and demanded the merger of Russian and Washington peace reconciliation efforts. Whether it would be acceptable by the US, remains a mystery. Anyway, the mere recognition of Taliban as genuine force worth negotiating for peace excluding the Kabul regime is a great development in itself. It is the US which has surrendered its earlier position and it is Taliban whose view prevailed. The US would like to remain in Afghanistan in whatever position acceptable to Taliban, either keeping their multi-billion dollars-built bases in Afghanistan or keeping a small number of forces in Afghanistan, desisting from interfering in domestic affairs while withdrawing major part of their forces from the country. Total withdrawal would mean defeat, a defeat of the American prestige and ultimate demise of NATO. This will never be acceptable by NATO. The July meeting in Qatar between Taliban and the US representative made some headway. It was decided, that Taliban should have a secure base inside Afghanistan, probably in Kandahar and Helmand. Bringing the Taliban to Moscow: Constructive Move or Waste of Time? The recently convened meeting in Moscow on Afghanistan was noteworthy for the presence of a representative from the Taliban. This the second meeting sponsored by Russia for addressing a peace settlement for Afghanistan. Reportedly up to twelve other states attended the latest meeting at varying levels of representation and participation. 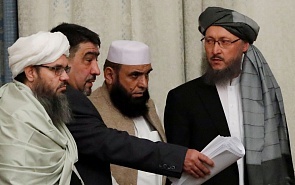 The meeting is significant for placing representatives of the Taliban and the Afghan government in the same room. But the question worth asking is - should the Taliban be in the room at all? It is also on the air, that Washington has asked the Ghani government to postpone the upcoming April (2019) Presidential election in view of the fact, that negotiations with Taliban might reach some sort of mutual understanding. However, the status quo stakeholders of Kabul regime are unnerved by the direct US contacts with Taliban. Dr. Muhammad Athar Javed is Director General of Pakistan House - International Think Tank.